It’s impossible not to be impressed with the job Residocracy and its allies did collecting signatures for the referendum against the Hines Paper Mate project. In retrospect they didn’t need to hire canvassers, since the paid signature gatherers only accounted for 2,200 or so of the 13,440 signatures Residocracy collected. Volunteers were all over the city: I was approached at least five times to sign. So now what? The layers of speculation are many. Will City Council repeal the development agreement or put it to a vote? Will Hines fight the referendum or throw in the towel and submit plans to re-use the old building? Can anyone mediate a new plan that would be acceptable to both Hines and the referendum supporters? I can’t analyze these possibilities because the answers depend on data and calculations (not to mention psyches and emotions) out of my reach. More analyzable, although not necessarily predictable, are the prospects for the referendum if it’s put to a vote. That’s because Santa Monica has had referendums on specific projects before. The votes that seem most relevant were the 1990 referendum on City Council’s approval of the hotel that Michael McCarty wanted to build at 415 Pacific Coast Highway (now the location of the Annenberg Community Beach House), and the 1994 referendum on the Civic Center Specific Plan. Santa Monica, as City Council candidate Sharon Gilpin sees it, has lost its way. While pursuing the admirable goal of finding money to pay for an ambitious array of social services, she says, the progressive politicians who have been running the city have struck a “Faustian bargain” with developers. The city may get the money it needs, but the price is a steep one: Hotels, office and commercial developments are transforming the beach community into a congested urban center. In October, when local reporters are writing about the election coming up, how many names of candidates will they be able to substitute for “Sharon Gilpin” in that passage and cut-and-paste it into their coverage? At issue in 1990 was McCarty’s beach hotel, which would have been built on state-owned land and which would have replaced a beach club that was beloved by many. The hotel was voted down overwhelmingly — 62% to 38%. This was also the election where voters passed measures prohibiting new hotels in the coastal zone and requiring that at least 30% of housing built in the city be affordable to moderate and low income households (which some interpreted as a means of stopping condo and other housing development). Earlier in 1990, City Council had repealed its approval of a big office development at the airport when presented with enough signatures to put the project on the ballot. These victories gave the anti-development side confidence that they could block large-scale developments. 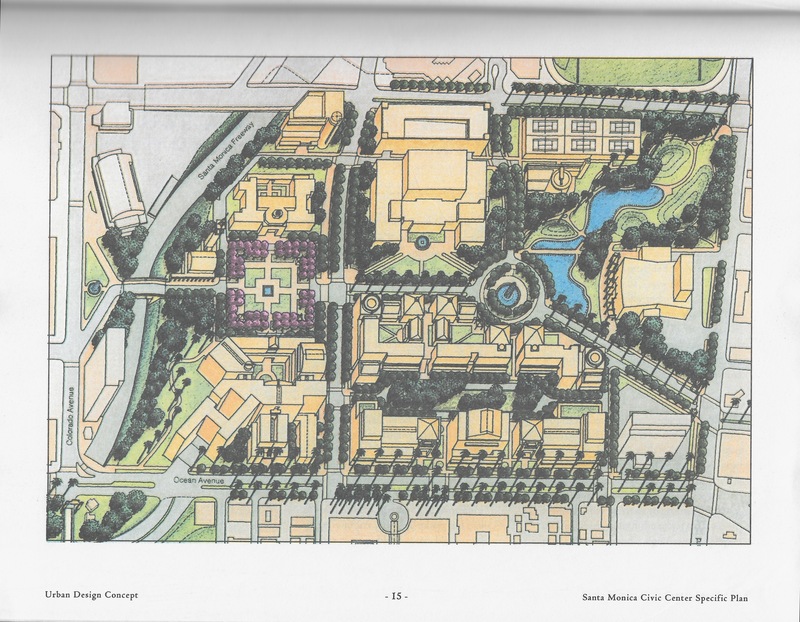 When the City Council approved the Civic Center Specific Plan in 1993, which allowed for the development of about one million square feet of offices and housing, they collected signatures to put the plan on the June 1994 ballot. This time, however, the voters approved the plan overwhelmingly, 60% to 40%, notwithstanding the rallying cry against it that it would generate an additional 22,000 car trips a day. Private vs. Public. The McCarty plan was going to allow a private developer to make money, and specifically allow him to make money on public land. In contrast the Civic Center plan put the profit-making development on private land, and the landowner — the RAND Corporation — was a local, well-respected nonprofit institution. With the Paper Mate project, this factor could go either way. The profits will come from private investment in privately-owned land, but the developer is seen as the archetypal big developer from out-of-town. Politics. Perhaps the key factor in the voters’ approval of the Civic Center plan was that the anti-development side of Santa Monica politics was split. The City Council vote approving the plan was 7-0 and the yes votes included two of the staunchest anti-development politicians of the time — Ken Genser and Kelly Olsen. In fact, Genser was one of the plan’s strongest proponents and had been deeply involved in its preparation (one reason why the plan was appealing). In contrast, the anti-development community was united against the McCarty hotel — as it is today against the Paper Mate project, where it believes it’s been ignored in the planning process. Plan suitability/quality. The McCarty hotel project was well-designed for what it was (and it included major public amenities), but it replaced a use, the beach club, that people liked, and building a luxury development on the beach is never going to have mass appeal. In contrast, the Civic Center plan promised to turn a superblock full of surface parking lots into something nice. On this issue, I’d say the jury is out on Paper Mate: Hines will be able to give voters appealing “before and after” illustrations showing how they will turn the old factory into something better, but they’re going to be up against the reality that adding more office development to that gridlocked location seems instinctively wrong. I also want to say something about the CEQA lawsuit the Santa Monica Coalition for a Livable City (SMCLC) has filed against the Paper Mate project. I haven’t read the complaint and in any case I’m not a CEQA lawyer, and so I have no opinion about whether SMCLC has a good case (except that good luck to anyone up against the redoubtable Marsha Moutrie, crosser of T’s and dotter of I’s). I have to applaud SMCLC, however, for suing on the grounds that the EIR did not “properly study reasonable project alternatives” — particularly alternatives with more housing and less commercial development. As I wrote in February, it was the narrow scope of the environmental review that at the end made it impossible for the City Council to try to negotiate a better project with more housing and less commercial development. This entry was posted in Uncategorized and tagged Armen Melkonians, Hines Paper Mate development, Residocracy, Santa Monica Hines Development by Frank Gruber. Bookmark the permalink. I have heard from reliable sources that the Huntley Hotel has donated $10,000 to Residocracy. If this is the case, I am assuming it is from a pure belief in grass roots action with no self interest whatsoever. I believe that using the vote on the old Sand and Sea site as an analogy for the Hines project is quite a stretch since the former would have brought privatization of public property and an elitist use.